The historical pattern of turning a full block of small lots into a single, or pair of very big buildings�threatened to consume�the south side of Wall Street between Broad and William streets and Exchange Place. �In 2000, the leadership of the New York Stock Exchange pressured the City, then the Giuliani Administration,�to create the conditions for a new home, with a more technologically advanced trading floor and other facilities. 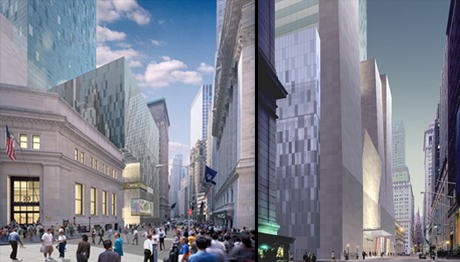 �After considering several sites, they settled on the block across Broad Street from the NYSE's address since 1865. The City promised to assist with the site assembly. 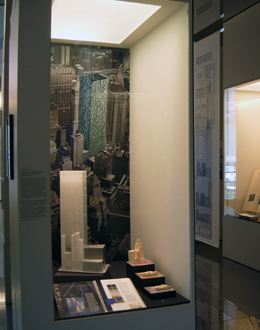 Above the Box, a Class "A" office Tower of approximately 1,300,000 gross square feet and approximately 35-40 floors.� Expanding upwards the openness created by the Box's mezzanines, the Tower is designed with a clear span over the Trading Floors using multi-story steel trusses that transfer the tower loads (gravity and wind) to columns along the perimeter of the Box.� The office Tower will be accessed through a separate lobby directly off Wall Street, the second floor of the Box. 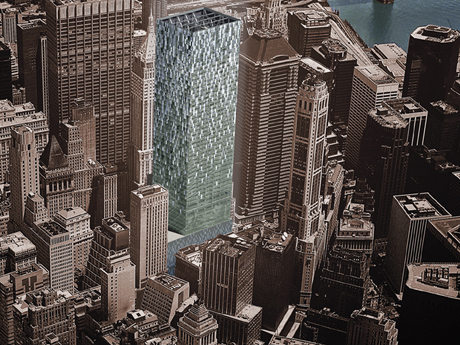 Unbuilt proposal for a new home for the New York Stock Exchange, with a 51-story, 1.4 million sq. ft. office tower above, 2000. The Clarett Group acted as Development Consultant to the City and State of New York for the development of the New York Stock Exchange building and tower, a planned 1.8 million square foot project. Clarett oversaw the design development of the entire project with architecture firm Skidmore, Owings & Merrill, and marketed the office tower component to potential tenants and investors. The project was abandoned following 9/11.